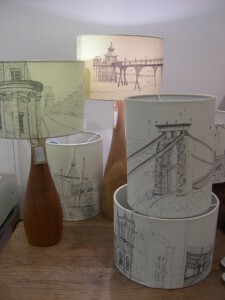 Next Saturday and Sunday – 17/18 May – Lisa Malyon’s hand drawn lampshades, drawings, prints and cards will be exhibited as part of the South Bristol Arts Trail. There will be several stall holders, as well as musicians and dancers, in the Southbank Club, 31 Dean Lane, Bedminster BS3 1DB – Venue No. 45 on the South Bristol Arts Trail map. Open 11-6pm. Many thanks for your time and hope you enjoy ‘trailing the arts’. Check out our twitter feed for the latest images coming in from the piers around the UK. Cromer Pier seems to have been badly hit overnight with the sea levels rising up through the pier. Users on twitter shared instagram pics and videos documenting the ride of the tides and the devastation that they caused. Our thoughts are with those who’s livelihoods rely on the Piers and we hope that everyone is safe tonight. Drakes hotel is a unique boutique hotel like no other in Brighton. The interior is a recipe made of orientalism blended into a traditional double fronted Georgian townhouse topped off with some Indochine French colonialism and finished off with a touch of decadence! An heroic employee from Brighton Pier leapt from the pier shortly after 6pm on Saturday when an uncocious man was seen in the water. A 999 call was made to Sussex Police advising that a male was in the sea having fallen from the pier. Brave Matthew Seekings, 22 from Brighton, quickly removed his shirt and steel toe-capped work boots before jumping the 40ft drop into the icy water to swim to the aid of the 43 year old man. The man had been spotted climbing over the railings before jumping in to the English Channel. On lookers had watched on aghast and helpless as the man bobbed under the water before he finally passed out. Matthew managed to keep the man above the water until the RNLI lifeboat reach them. The RNLI transferred the man to an ambulance which took him to the Royal Sussex County Hospital where the man was described as being in a serious condition. 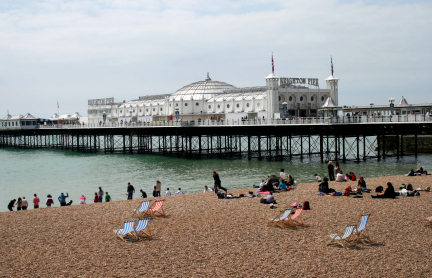 The RNLI confirmed that the crew of its Brighton lifeboat had been called out at 18:35 to assist a man in difficulty near the Brighton Palace Pier. An RNLI spokesperson said: “On arrival on scene, a male was face down in the water, unconscious and being assisted by members of the public. “The crew recovered the casualty on to the lifeboat (and) immediately began CPR (cardiopulmonary resuscitation, also known as heart lung resuscitation) and administered emergency care. “As the ambulance crew were on land close to the Palace Pier, the helmsman of the lifeboat made the decision to land the casualty on the beach rather than transport him back to the lifeboat station. Morning readers, hope you are all well! We’ve added a couple of new piers to our site this past week. Cromer Pier in Norfolk has been covered and can be seen here. Please feel free to leave some comments and feedback on both the pier and the article. Our second featured pier this week was Bangor pier in north Wales. Why not find out a little more about Bangor pier by visiting our article which can be found at this link. We have a couple more British piers to add this week so be sure to check back and see what we have to say about them! Finally we will be undergoing a website change over the next month. Our aim is to make the site easy to navigate as well as provide more simple facts and links. We will also have some great new features that we’ll be rolling out so keep your eyes peeled!